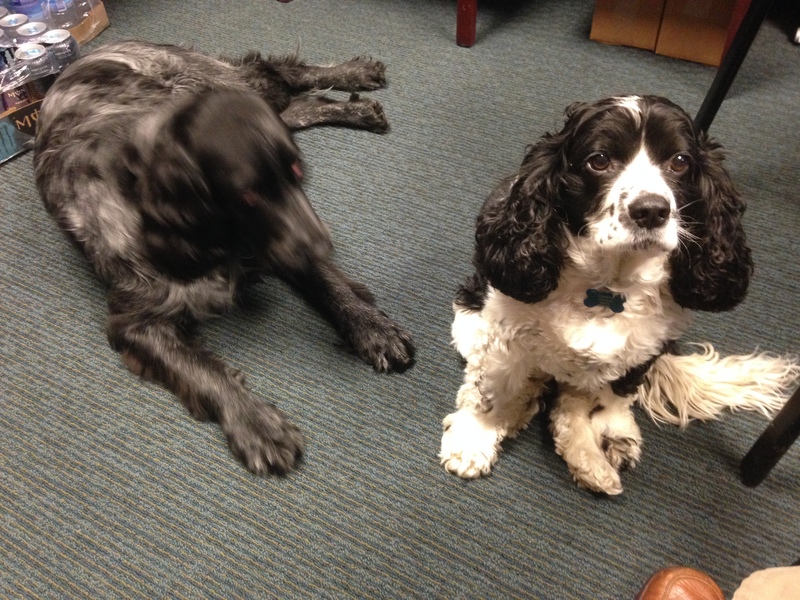 Inky and Pocket, the WoundDogs at Encompass HealthCare, are members of the beloved staff at the outpatient wound care center. Here, they take time out from napping to tell us about their work and their life at Encompass. INKY & POCKET: No? You sure? Seriously? Positive? Absolutely sure? Second chance? Once more? Not right now, but later? Maybe? POCKET: No worries. We’ll keep an eye out in case you drop something. INKY: It’s what we do. After all, we’re dogs, first. POCKET: WoundDogs, that’s our family business. We’ve been doing wound care for ‘bout four years now. POCKET: ‘Bout 28 years in dog years. INKY: Hey, I just heard the fridge door open. Be right back! POCKET: Anyway, we’re quite critical to the operation here at Encompass HealthCare. See, Inky and I give the place atmosphere. We put the patients in a good space to heal, h-e-a-l, not the “heel” like “sit down.” It’s aesthetics. We add that “je ne sais quoi” that you won’t find in any other wound care facility. INKY: False alarm. Doc was just putting his lunch in there. POCKET: I was just going over what we do here. INKY: You tell ‘em the French thing? INKY: That certain something. 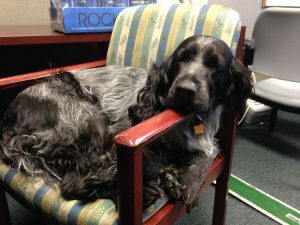 I’m a darn-near-perfect Blue Picardy Spaniel. INKY: …On account of he’s just black and white without the telltale classic brown accents. POCKET & INKY: But we don’t judge. INKY: We’re not here to judge. INKY: …Then, we go into F.C.M. : Full-Cute Mode. I sit real pretty with a “you’re the most important person living” expression on my face. Pocket always seems to be on break. POCKET: And I generally roll onto my back, wag my tail and show you my goods. POCKET: And I can make myself look exactly like the Lady dog in The Lady and the Tramp. INKY: Except that she’s brown and tan and you’re all black and white. POCKET: Jeesh! Why can’t you ever let that go? POCKET: You never miss a chance to point out my non-traditional coloring. Am I cute? This is what Pocket thinks he looks like. POCKET: Then let’s leave it at that. POCKET: We were so close. INKY: So close to that sliced turkey. POCKET: But it wasn’t to be. But what is meant to be is that we are WoundDogs. Make no mistake about it. Our job is all about you. 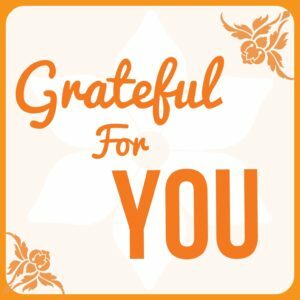 Our patients love us and we love them back. INKY: Along with whatever they might happen to be eating. POCKET: Yeah, because we want to make you feel at home. 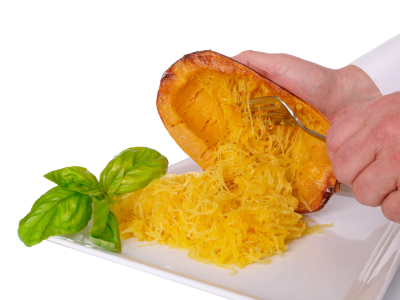 Spaghetti squash is a great substitute for normally high-carb spaghetti. 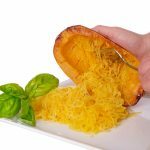 At Encompass HealthCare and Wound Medicine, we talk a lot about making dietary food substitutions in order to take in more protein, lose weight or gain energy to aid in wound healing. Sometimes, the substitutions we recommend are appropriate for a much larger audience than just wound care patients. Diabetic, cardiac and obese patients can make important strides in their health by making simple substitutions in their diet. With that in mind, I made two important discoveries this week that have revolutionized my entire diet. I cooked with garbanzo flour and I learned how to make fried rice out of cauliflower. This is literally, and I use the term “literally” correctly here, the best thing since sliced bread. 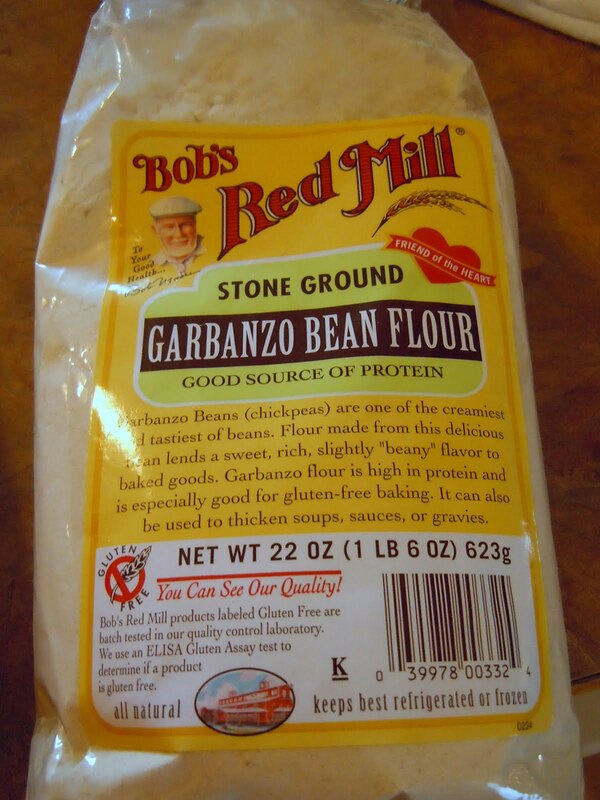 Garbanzo Bean Flour is available in supermarkets and online. That’s because I can now use garbanzo flour in recipes where I used to use wheat products and the end result is not only tastier, it’s infinitely healthier for me. Garbanzo beans are a rich source for protein, dietary fiber and healthy carbohydrates. They’re also very low in fat. This discovery is a personal triumph for me as I used to pride myself on being able to make healthy substitutions in all my cooking. My substitutions, though, did not necessarily result in a trim body or more energy. For instance, I learned how to substitute skim milk for whipping cream in Fettuccine Carbonara, which is like ordering a Boston Cooler made with Häagen-Dazs ice cream and telling the server to use Diet Vernors instead of regular Vernors. No big payoff there. Then when Egg Beaters came along, I saw the clouds part and a heavenly ray of light shine down. Finally, the answer to high cholesterol had arrived! Unfortunately, they arrived along with mandatory nutritional labeling, and you had to be a chemistry major to figure out what they were actually made of. Plus, they didn’t taste all that wonderful. Then, there is the never-discussed shame of ordering Egg Beaters in a restaurant. If you’re heavy, the server thinks you’re cheating somewhere else in your diet. And if you’re slender, you’re obviously high maintenance. There’s no winning with egg substitutes physically or mentally. 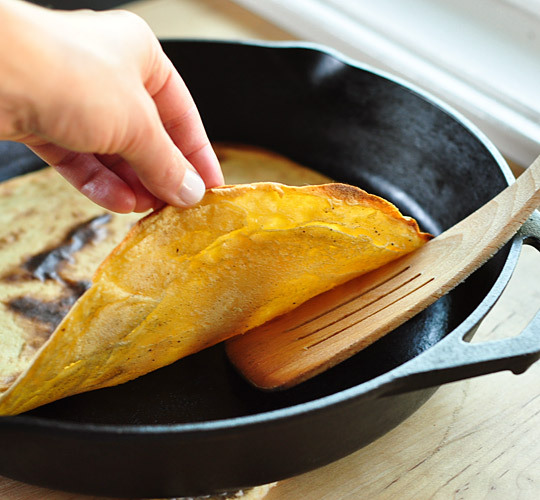 Socca is a gluten-free flatbread made from garbanzo bean flour. 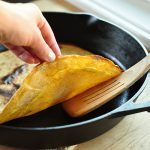 I did make the transition to substituting fresh egg whites for whole eggs in recipes and I learned to accept the texture changes in the finished products. Luckily, it’s 2014 and fresh whole eggs are enjoying some great publicity for being on the Good-For-You List again. I am cutting back on the yolks just a bit. 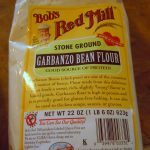 What brought me to garbanzo flour was the advice from my cardiologist that I give up all wheat, rice and potato products; and the advice from a good friend that I try socca, a food that’s like bread only it’s made with garbanzo flour instead of wheat flour. Cue the choir, it was fabulous. Then, while putting together a ground turkey meat loaf, I substituted garbanzo flour for breadcrumbs and got another marvelous lift – a super protein, high-fiber meat loaf that held together perfectly. Is there anything these garbanzo’s can’t do? 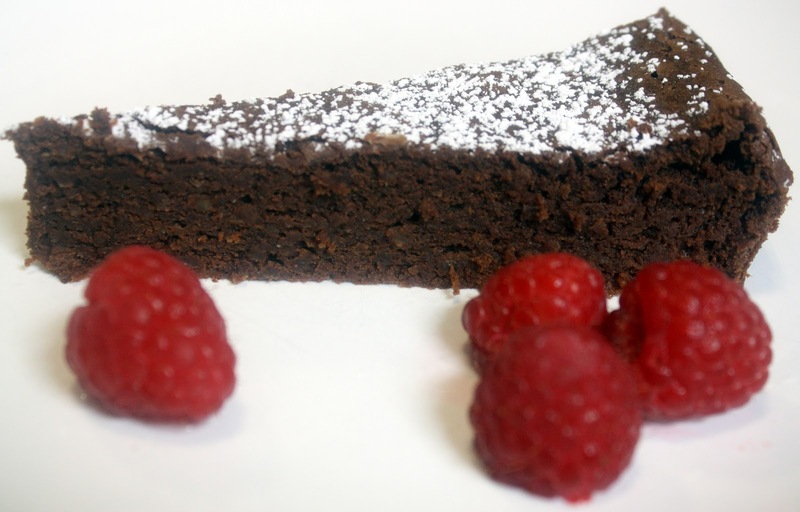 Luscious chocolate cake made from garbanzo bean flour: Heaven! Pulse the cauliflower in a food processor or use a grater to make superb cauliflower fried rice. Now about that fried rice made with cauliflower. Who knew! I saw this demonstration online, I tried it and not only did I not need a nap after eating it, I actually felt quite energized. One of the secrets is using a food processor to pulse the uncooked cauliflower into tiny rice-size pieces. Then during the cooking process, you only use a small amount of liquid to steam the cauliflower so it doesn’t turn mushy. Once you understand the liquid-holding and liquid-releasing properties in vegetables during cooking, there’s practically no limit to how you can use them as substitutes to enhance your nutrition. Spinach, for example, releases a lot of moisture when it’s cooked. Spinach releases a lot of moisture during cooking. The same goes for mushrooms. So if you’re making quinoa with spinach and/or mushrooms and you want the same drier consistency, you have to use a bit less liquid than the usual two parts water to one part quinoa in the recipe. In the beginning, using vegetables as substitutes in recipes works best when the seasonings usually overpower the dish. Like in the cauliflower fried rice, the soy sauce and seasonings over power any strong cauliflower taste. Like spinach, mushrooms release liquid during cooking. Later, as you become more accustomed to the flavor and texture of the cauliflower, you may find yourself using less of the overpowering flavors in order to let the cauliflower taste come through. So now that you can’t wait to garbanzo your diet, where do you get garbanzo flour? Well, you can make it yourself by grinding non-hydrated garbanzo beans in a spice grinder until they’re the consistency of flour, you can buy the flour already processed at most big supermarkets, or you can buy it online. Try garbanzo flour for wheat flour. Check out cauliflower in place of rice. You can even prepare parsnips so they taste like sautéed potatoes. There’s no substitute for substitutions when it comes to eating healthier. I’ll get back with you. The term “flesh-eating” disease (necrotizing fasciitis) is a scary and often misunderstood term. Read Dr. Bruce Ruben’s article here to understand this disease and to set the facts straight. Congratulations to Dr. Bruce Ruben! He Has Been Awarded Compassionate Doctor Award, One of Only Three Percent to Receive Honor! Congratulations, Dr. Bruce Ruben! 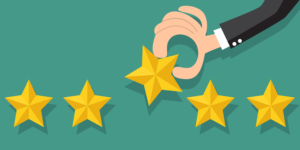 Vitals physician rating site has just awarded Encompass HealthCare & Wound Medicine’s Dr. Ruben with a 2013 Compassionate Doctor Award, one of only three percent to receive this honor.